What absolutely brilliant news to brighten up a pretty dismal February - Sophie and her lovely boyfriend Alex are engaged, which is just so exciting. Nobody could accuse the Lewis girls of whirlwind romances, this one has been going for 10 years, but it was still a really lovely surprise. Alex popped the question at Somerset House last Thursday evening, and we were so lucky to be meeting up with both Alex & Sophie and Tom & Anna on Saturday anyway for the England v Wales rugby international. We had a thoroughly lovely and very full day. A quick visit to Felbridge with Askeaton, then a quick wash and brush up and onto the train to Twickenham, lunch with Sophie's lovely friend Charlie Banks, the rugby and then a celebratory dinner with all the Lewises and Alex's parents Bridget and Simon. 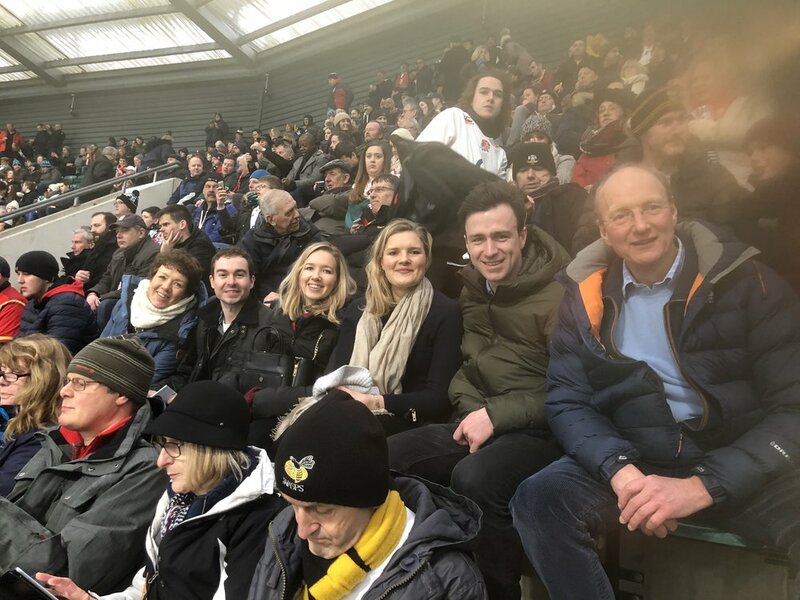 Wrapped up very warm at the Rugby. As Shane is still in Dubai and I had entered Kvint and Emma for a show at Gent in Belgium, I have been having some training with Trevor Breen. This has been fantastic, definitely working in parallel with Shane, but concentrating on different aspects of my riding, and noticing some of the not so good habits that have crept in over many years. The first time I took Askeaton, Kvint and Emma. Askeaton is so brave and such a trier and was amazing for a horse that has been broken for less than three months. Next I jumped Kvint, and we tried to iron out the fact that I ride him like a 128 pony, having him bent slightly to the outside, rather than soft and round my inside leg. This is, in my opinion, a lot harder than it sounds! I was more successful with this on the first session than the second for some reason, but he is jumping really well and seems stronger and making a more powerful jump. Finally I jumped Emma who was in great form. Trevor helped me to use my body weight and position to control her, rather than fighting with my hands which was really successful. This was all inspiration enough to send me off to my first show of the year at Felbridge with Kvint and Emma who jumped really well in the 1.20 and 1.30 respectively, and to take Askeaton to her first show on the Saturday where she jumped bravely and greenly round the 85 cms. The following week I took Kvint and Emma to Trevor on the Monday, consolidating the information from the first lesson, and Askeaton and Heidi on Wednesday which was a fantastic help. Falling off Heidi had given us both a bit of a fright and Trevor helped me get her going and cautioned me that the only person who could solve the problem was me! Packed into this rather busy week was a very exciting visit to Saracen's mill at Aylesford. Mark and I both went, and had not only a brilliant tour of the mill, watching the grain arriving in lorries and then seeing it mixed and poured into bags and then stacked on pallets, but also were given a fascinating insight into just how much testing it takes to ensure that we can feed our horses without worrying that there is anything in the bag that shouldn't be there. I had no idea just how many little things can blow on the wind or the wing and make the feed a possible dope test nightmare! Well done and thank you to Saracen for all the work, research and foresight that goes into every bag. Kvint and Emma both jumped really well at Felbridge on the Thursday and having had another practice with Heidi and Askeaton at home Steff and I got up very early on Saturday to take them to Felbridge. Heidi jumped really well in the clear round at her first ever show, so we put her in the 85cms where she just had one down when she got a bit weary. Askeaton was thrilled to be at her second show - telling me what an expert she was now. After quite a long working in time she jumped a double clear in her first British Novice - so perhaps she is right. I think a small adjustment in the steering would make her look a bit more expert, so roll on the next show! I was so thrilled with both of them. It hasn't been a very long journey yet, but certainly breakers test you in many ways. It can be a little bit scary some days, and a little bit frustrating on others, but the good days certainly make you smile, and when I am watching these two on the live-stream at some huge show in 2024 I will be very proud to have been a part of their baby steps! Steff and Camilla will have been a huge part of the journey too - it takes a great deal of patience from the ground as well as the saddle to give these four-legged babies confidence and manners in the right proportions. Marine also jumped at Felbridge on Saturday and she and Emie jumped a lovely round, having a very unlucky four faults. It was also great to see Emily Moss, and Sarah Travis going so well on their horses, both having been based here at various times, it's really lovely to see horses and riders that you have got to know going confidently and impressively. Marine, Mark and I then spent a very labour intensive hour or so packing up the lorry this afternoon as I was meant to be going to Gent in Belgium on Wednesday, but sadly Emma was very much not herself this evening, a tiny bit of colic and then generally not at all well, so while writing this blog I have been popping up and down to the yard to check on her. She seems a little bit brighter now so hopefully she will keep on improving overnight. It's not going to be a very peaceful one!